Proiphys cunninghamii is a member of the Liliaceae family and is native to Australia to South-East Asia. The Brisbane lily occurs in light shaded areas of the rainforest or in open forest bordering rainforest regions. 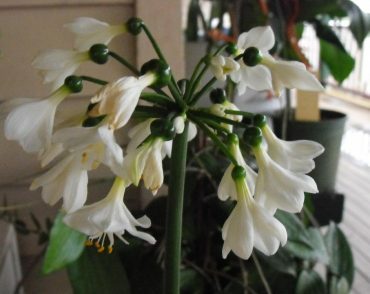 They grow from bulbs and are not widely used in horticulture but the large leaves which are produced on long petioles make them great garden plants. The fragrant white flowers are produced in umbel-like clusters on long stems. Plants die back to an underground bulb during winter and should not be disturbed at this time. Proiphys are ideally suited to warm frost-free areas and can be grown in a rockery, beside a garden pool or in pots or tubs in cooler regions. 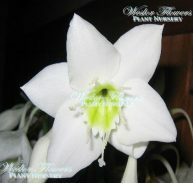 They are hardy and easily grown although development to the flowering stage is slow. They do best in well composted soil in sheltered areas of the garden with little sun. Proiphys cunninghamii (syn. Eurycles cunninghamii) is commonly called the Brisbane Lily or Moreton Bay Lily and is the only species confined to Australia. 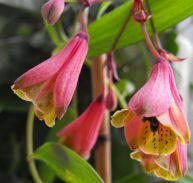 It has dark green heart-shaped leaves carried on long upright stems 100-250 mm long and 80-130 mm wide. It occurs naturally on the north coast of New South Wales and in south-eastern Queensland in lightly shaded conditions in the rainforest or forest bordering the rainforest.